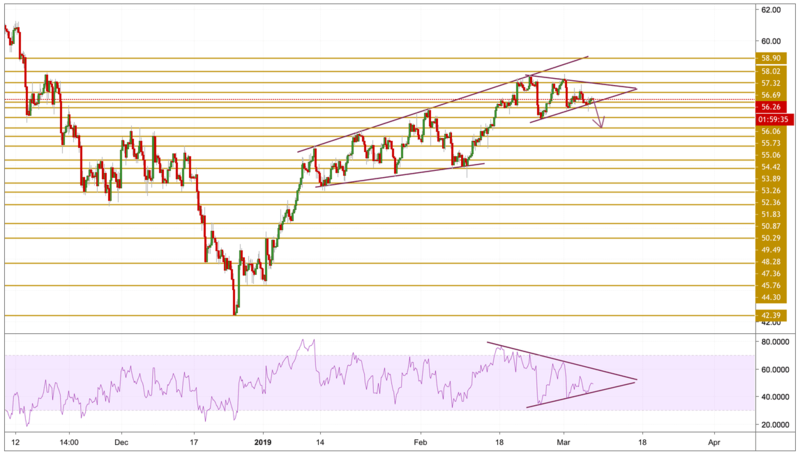 Crude oil prices had rallied in the last few days on hopes of the US-China trade conflict coming to an end, however it looks like we are now stuck in a consolidation phase, as the weekly report published by the EIA showed that oil inventories in the US increased by 7.1 million barrels from the previous week. Nevertheless, investors seem to be refraining from making large bets while waiting for the next significant headline in regards to trade talk progress. Crude oil prices remained relatively intact after failing to break below the lower band. The price is now still trading just above it and precisely above the $56 level. Momentum is turning bearish however and prices looks set to break below the pattern shown on the chart. We will be focusing on the $54.41 key support level next.